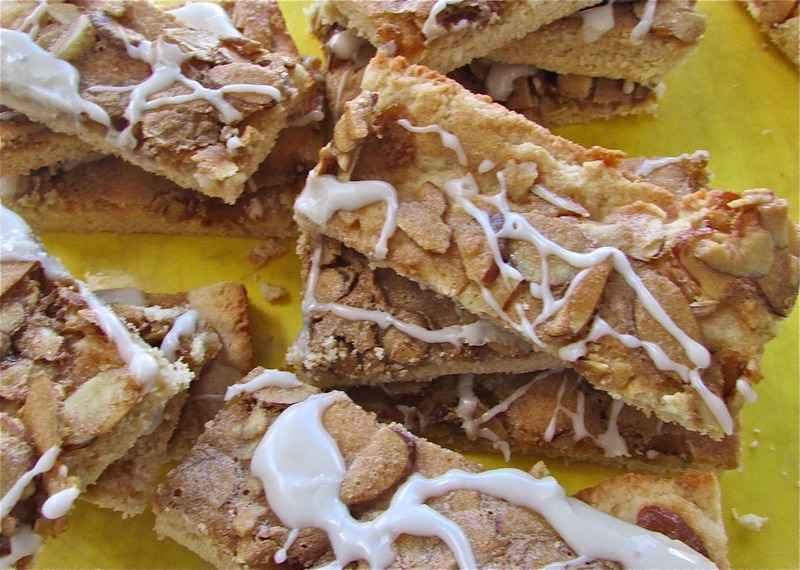 Take a break with light and crunchy almond bars. Recently I was perusing the aisles my favorite local organic grocery and health food store, Herban Marketplace, here in my town. I had not been by in awhile so it took me a couple of passes to take everything in and then decide what I wanted to walk out the door with. I hit the “baking area” where I found several unusual flours. The two I chose this time were coconut flour and sweet sorghum flour. Once I got home I did some research on both and decided to put the coconut flour to use immediately in some scratch baking. I had been thinking about resurrecting a recipe I haven’t made in several years and this seemed like the perfect match. It is unusual to get a recipe great on the first try and even though I said I’ve made this one before, I fiddled around with the ingredients and the amounts, so I thought ”there is no way this will come out great on the first try.” Hey, I can be wrong…occasionally. Let’s just say I wish I was wrong like this every time I try to concoct a new recipe and/or mess around with one so much. These are really good ya’ll. Coconut flour is made from coconut (obviously) and because it is gluten free those with an intolerance or allergy to wheat can use coconut flour as a substitute. Now, neither I nor anyone in my family has gluten issues, I just thought it would be fun to try out coconut flour. According to the folks at Bob’s Red Mill, coconut flour is high in fiber and protein and low in digestible carbs. All of these facts do interest me, so with a bag of sliced almonds and a package of coconut flour I set about making almond bars. 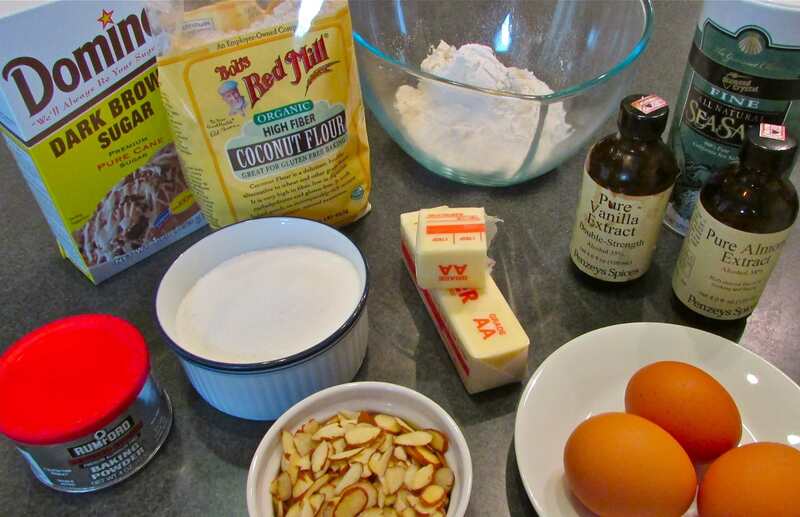 Do not overbake – I read this several places when using coconut flour. The bars may seem a little on the cakey side when warm, but after cooling they are crunchier. Cover any uneaten bars under plastic wrap or in a container with a tight fitting lid. Be patient when pressing the cookie dough into the sheet pan, it may seem like there isn’t enough, but there is. Don’t skimp on the amount of butter used in the cookie crust dough – coconut flour requires extra fat and/or liquid for proper results. In this recipe I use a 50% all-purpose flour /50% coconut flour combination so if anyone out there tries all coconut flour or someone other gluten-free combination with this recipe, I’d love to know how it works out! Ingredients. There is the coconut flour, on the left. 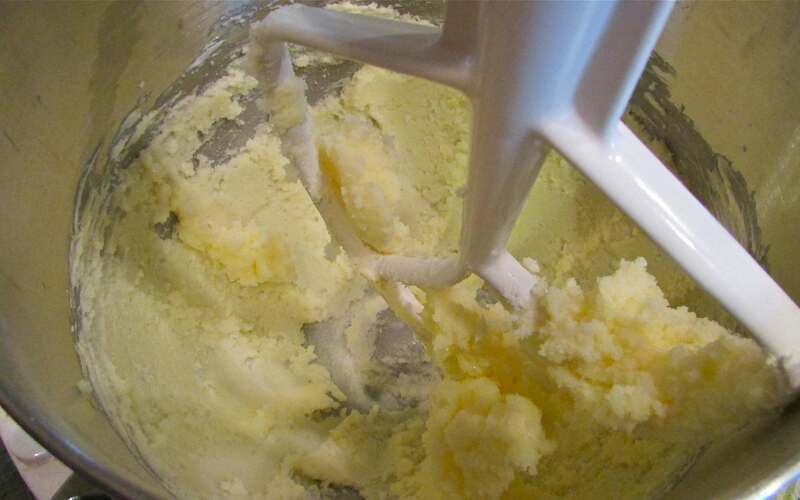 Mix the butter and sugar until well combined (no need to ‘cream’ them, however). 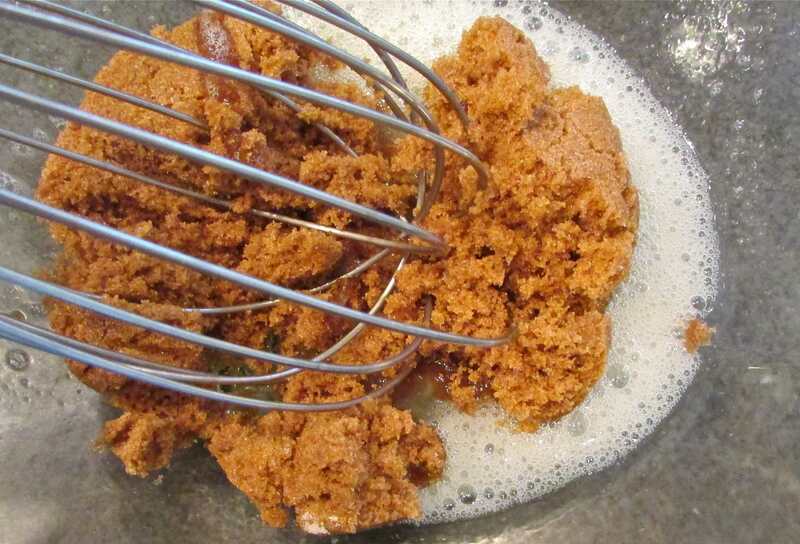 Add the eggs and extracts to this mixture. Then add the flour mixture to the butter/sugar/egg mixture. It makes a thick dough. And here is the dough. It’s sticky too but is easily pressed into a jelly roll pan. …and here it is all pressed out. Girly Girl helped with this part! Spread the topping on the crust and it’s oven-ready! Here are the bars right out of the oven. It took exactly 15 minutes at 350 degrees. 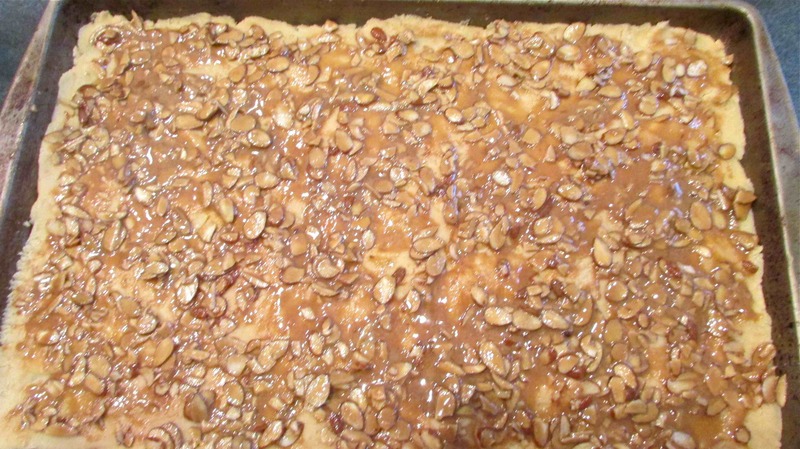 Allow to cool a couple of minutes, drizzle with glaze and slice into delicious bars. 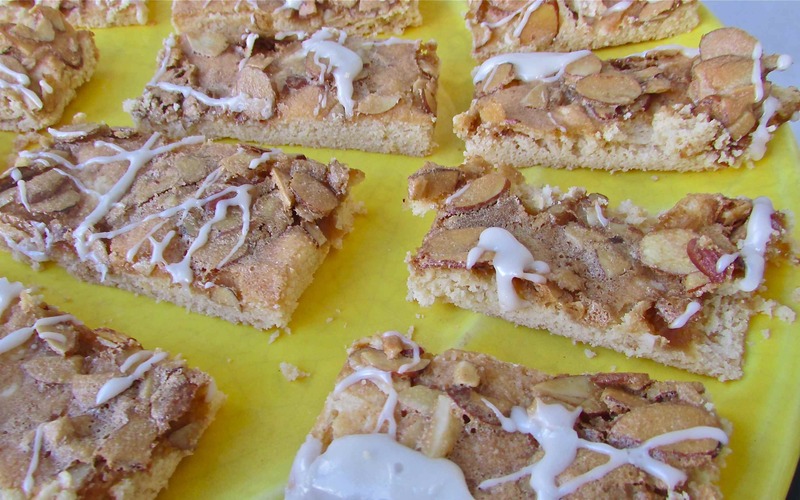 Almond bars – so good with a hot cup of coffee or tea… or a cold glass of milk! 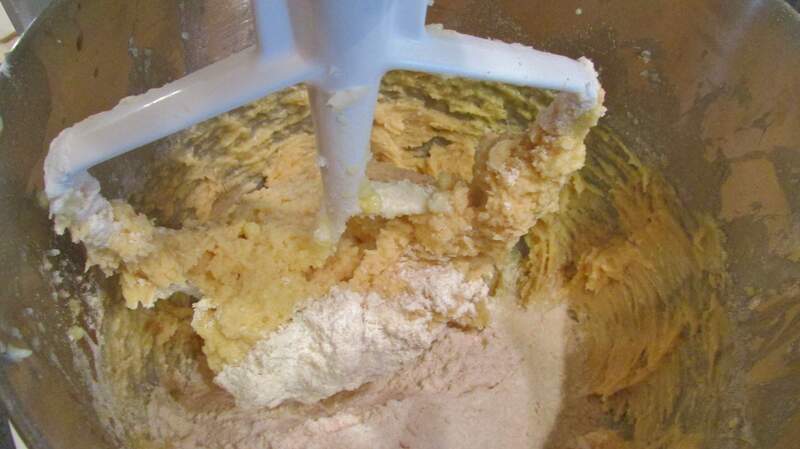 In a mixer combine the butter and sugar and mix well. Add in the eggs and beat several minutes, scraping down bowl if necessary. Mix in the extracts. In a separate bowl stir the flours, baking powder and salt. 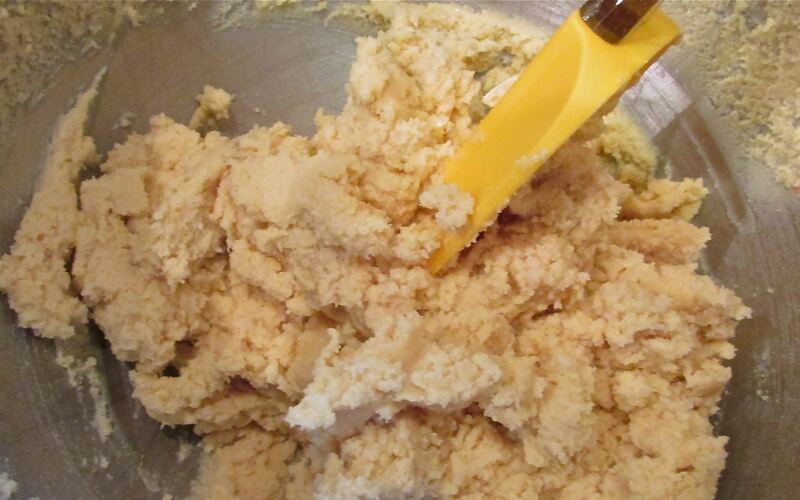 Slowly add this mixture to the butter/egg mixture, scraping down the bowl if necessary. Dough will be sticky. 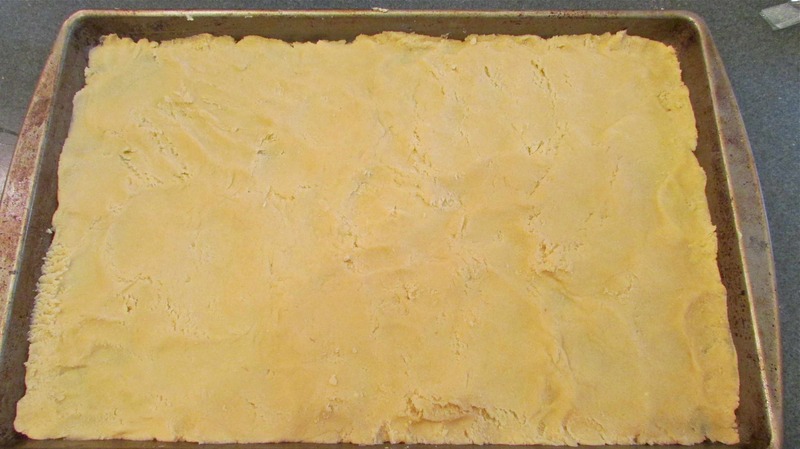 Press dough into a 9 x 12 inch cookie sheet (with edges) or a jelly roll pan. Set aide. Preheat oven to 350 degrees. In a medium bowl whisk the egg white until frothy. Add pinch of salt, extract and sugar. Mix to combine. 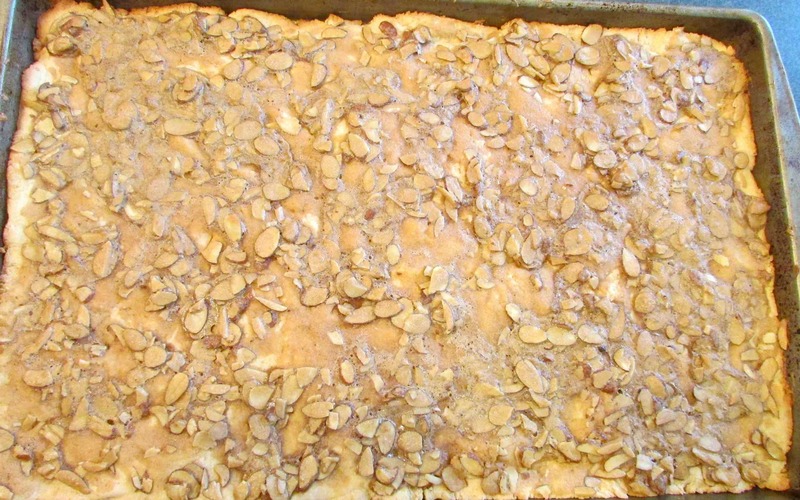 Fold in almonds and spread this topping over the cookie crust layer. Bake in 350 degree oven about 15 m9inutes. Do not over bake. Remove from the oven and allow to cool in the pan just a couple of minutes. Drizzle with glaze*, if desired and cut into bars. Makes 36-48 bar cookies. *My favorite simple glaze is confectioners sugar mixed with fresh lemon juice and vanilla extract. Mix about 1 cup confectioners sugar with 1 ½ – 2 tablespoons lemon juice and ¼ tsp vanilla extract. Too thick? Add a drop or two of lemon juice (or water) to thin. Too runny? Add more confectioner’s sugar 1 tablespoon at a time until you get the consistency you like. 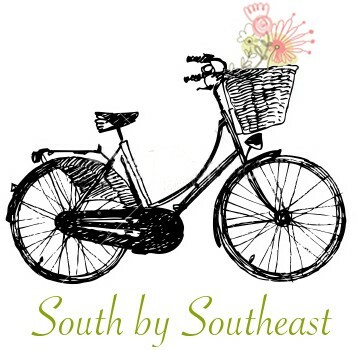 This entry was posted in Recipes and tagged almond bars, cookie and bar recipes, dessert recipes, recipes with coconut flour, tea time recipes. Bookmark the permalink.